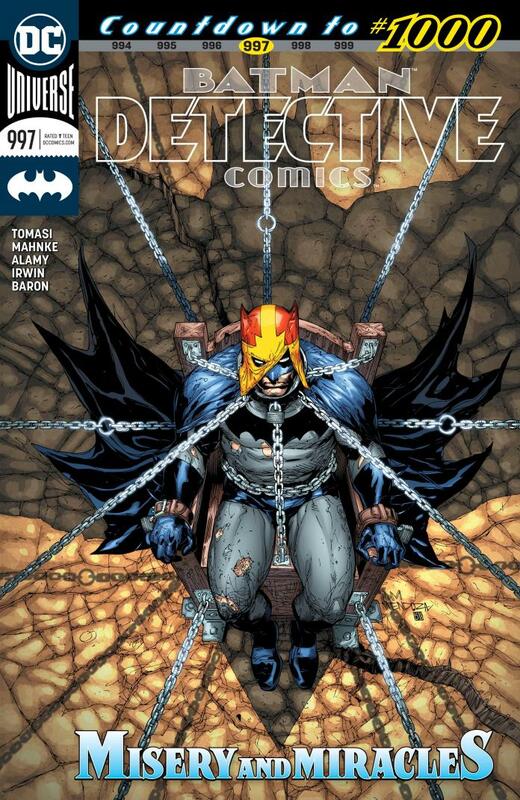 This week Detective Comics #997 comes out and brings us closer to the 2nd milestone event in DC Comics history. This series will be the 2nd series to reach issue #1000 and what better writer to lead the way to this achievement. Since Peter J. Tomasi has taken over on Detective Comics, it’s been one hell of a ride. As I read this issue, I kept thinking to myself ‘THIS is what Batman is supposed to be!’ Not to throw any shade at the other writer currently writing for the Caped Crusader, but this is what Batman is supposed to be. I’ve loved everything about Tomasi’s run so far and it just keeps getting better. This issue puts Batman and Thaddeus Brown in a pretty tight spot, having them both bound up while water continues to rise over their heads. If being deprived of oxygen wasn’t enough, they must also deal with the threat of sharks and piranhas. Really simple story telling but the art team and Tomasi really found a way to make this thrilling. Having Batman’s inner monologue laying out the details of this amazing escape really kicked it up and made it a blast to read. Of course with Batman, escaping the trap is never enough, because once he frees himself and Thaddeus, he finds himself face to face with the shape shifting creature he’s been dealing with since the start of this run. Only this time, the creature takes the form of Batman himself and tries to deal a little psychological warfare. Of course, Batman comes out victorious, has a quick moment with Thaddeus before heading off to deal with one of Batman’s well-known rogues from his gallery. This story kept the action ramped up and really drew me in. Honestly, the pages just flew by as I read this story. It is so nice to have a real Batman story I can enjoy, from a writer that understands the character. I cannot give Tomasi enough praise for his work so far; however, he isn’t working alone and credit must be given to the team of artist that really made this issue come alive. The way this team was able to create the series of events and make it gripping is truly a work of art in itself. Watching Batman do his best to survive this trap while dealing with the sharks and piranhas is amazing and credit is given all to this team of artists. There was no doubt in my mind this was a 5 star issue by the time I hit the end of this issue. If you haven’t been keeping up with this series since Tomasi came onboard then I highly suggest you do so. This has been an action packed and thrilling ride that is sure to make any Batman fans happy. This issues picks up with last issue’s cliffhanger as Batman has walked into a trap with Thaddeus Brown, the original Mister Miracle. The pair are trapped in an airtight room filled with water and sharks all while being bound by leather straps. Needless to say, they are in trouble. Batman not only saves himself, but Brown as well, something he hasn’t been able to do for all his “teachers” that have been targeted. Upon escape, Batman must face the shape shifting creature again. Batman succeeds in stopping it, but apparently has no new leads…or does he? The issue ends with Batman arriving at Hugo Strange’s lab looking for answers…. This issue is a bit of a mixed bag…the whole escape sequence is well paced and exciting. Batman’s thoughts are clear and the reader understands his plan as he executes it. The drama is heightened at just the right moments and Batman’s desire to save Thaddeus are relatable and engaging. This could’ve been the whole issue and it would’ve been enough. This is probably the best Mahnke’s art has looked so far in this storyline. The underwater effects by the entire art team of Mahnke, Alamy, Irwin and Baron work exceptionally well. There’s no doubt they are underwater as they are able to affect a muddled clarity to the sequence. The biggest drawback to the issue is the redundant fight with the shape shifter. Its dialogue is over the top and elusive and it doesn’t really add to the story. We learn nothing more about it than we knew last issue. It chose different people in Batman’s life to taunt the Dark Knight, but it added no real substance. It actually detracts from the issue as a whole. Finally it’s a bit out of nowhere that Batman decides to seek out Hugo Strange, unless he’s putting two and two together and coming up with shape shifter=Hugo Strange’s monster men, despite having more the abilities of Clayface. While this issue doesn’t move the story forward as much as last issue, the escape is well executed and an exciting bit of reading. 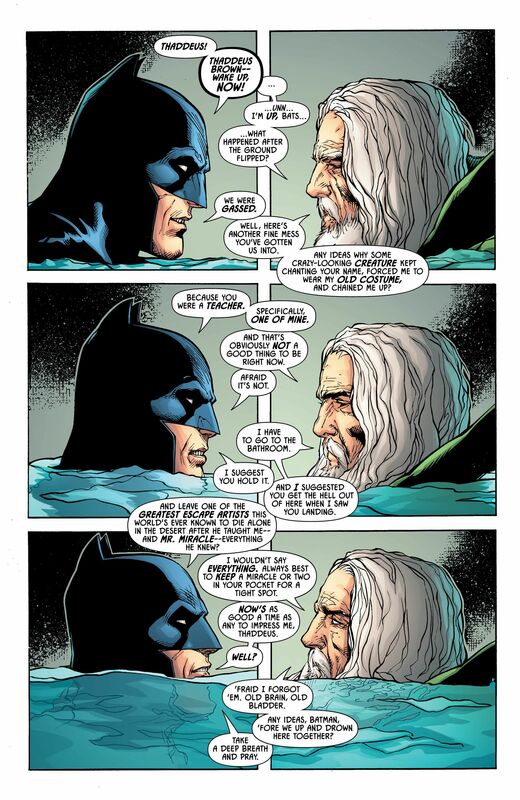 Additionally, the insight into Batman’s mind on both a personal and technical level is interesting and unique. We don’t always get that deep inside Batman’s head to understand how he sees and feels these situation. Keeping the fight with the shape shifter to a minimum and showing more of Batman’s thought process to go after Hugo Strange next would have improved the issue.